I recently wrote about a piece of artwork I was creating for a group exhibit. That exhibit, Scarlet Steps, has now come and gone. And once again it was great to see the creative solutions artists developed as they worked within this year’s theme. The theme is always based around the gospel. This year Jay O’Maille, a talented gentleman from my church who is a writer/poet/songwriter/rapper, wrote a song called Villain that presented the gospel message in a unique way. Our job as artists was to align our pieces with this story song. 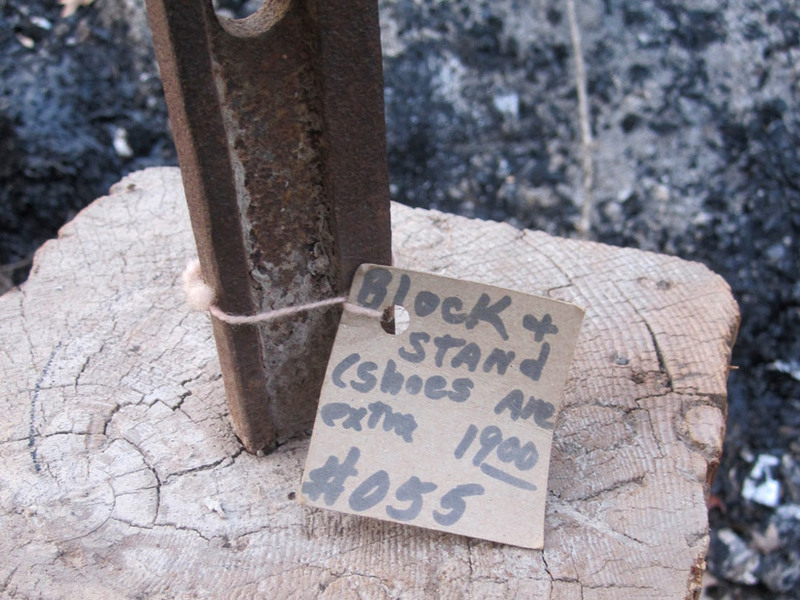 My piece started with the purchase of an antique cast iron cobbler shoe stand. Now I had no interest in the stand itself. 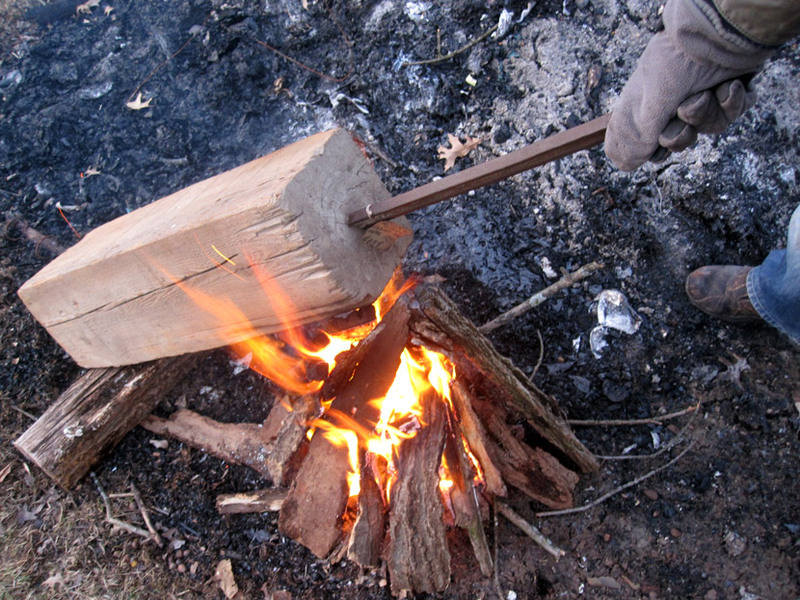 I was more interested in the perfectly-sized block of wood that it was hammered into. And while this may have created a convenient setup for a cobbler, it wasn’t idea for my master plan. But I figured I’d work around it, as all efforts to take it out failed. This antique cast iron cobbler shoe stand was purchased from my neighbor for $19. My basic concept was simple. I would burn the lower half of the wood. This represented sin. And burning the piece in a strategic manner was easy as I was able to use the shoe stand as a handle. The top half would be painted with gold leaf. This represented the greatness of what was accomplished by Christ on the cross. After starting a small fire, I burned the upper half of the stand, which would end up being the lower half of the artwork. And between the two would be red, representing Christ’s sacrifice on the cross—a sacrifice that provided sinful man a path to God’s glory. So this red would need separate the ash from the gold, yet unite them at the same time. This was a challenge. My first solution was to carve a five-inch tall, half-inch deep strip all the way around the center and paint it red. And that solution was OK, but it was too abrupt. It left me wanting. My other big problem was the shoe stand. It didn’t play a part in my plans for the piece. However, the need to work around this metal stand pushed me in a very beneficial direction I would not have otherwise considered. As the stand stuck out the bottom of the piece, I cut a section of hefty carpet tubing just a bit longer than the stand, placed it upright on the ground, then slid the stand down into it. I now had my piece resting vertically atop the tube and the stand itself was shrouded, no more to be seen. But while it made for a good base, the tube was still inelegant. 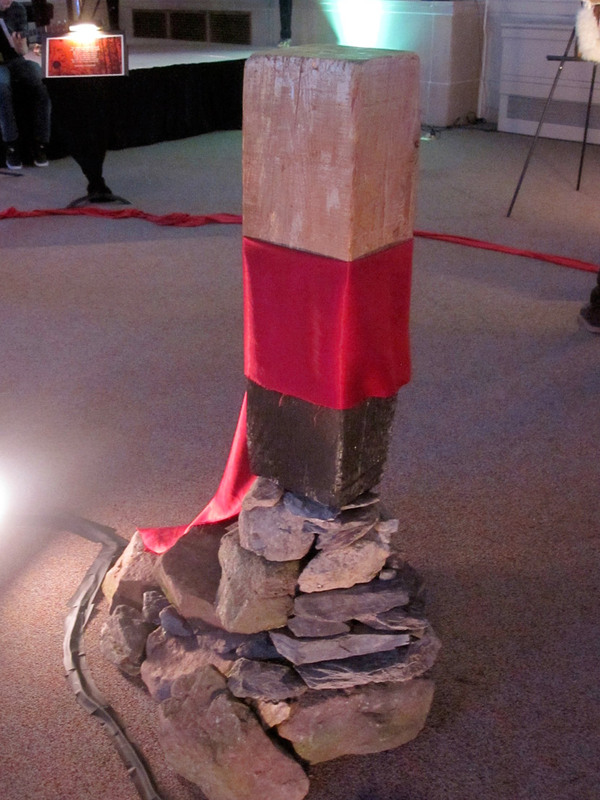 As the piece also represented the base of the cross, it seemed right to rest it atop a pile of rocks. So off I went in search of rocks. I pulled a decent number of river rocks from a stream that runs through our property, but couldn’t gather near enough for my purpose. Then I remembered I had a collection of large rocks from a dismantled landscaping project. Having all my supplies, I now brought each of the puzzle pieces into my yard and put them together. The rocks were stacked around the tube and they looked great, giving the appearance that the wood block was resting on top of them. And the piece itself was good…except for that red inset strip. It just wasn’t right. Enter my wife. She suggested wrapping a red cloth around the center—and that was the perfect solution! It tied the ashes and gold together while keeping them separate, and it introduced a new texture. The golden majesty of the cross was made necessary by the ashen decay of our sin. But bridging the gap between glory and sin was sacrifice. Between the Hero and the villain was pain. Between Christ and me was shed blood. Many heavy stones were carried in to complete the installation at The Trust Center in Lancaster, PA for Scarlet Steps 2014. Upon completion of the event, I dismantled it, took all the pieces home and planned on eventually recycling the wood for another purpose. I had no expectation that someone would want it, but that’s exactly what happened. The person who wanted it saw it as a cairn. A cairn is a pile of stones set up in honor or in memory of someone or something. And she wanted to set it up in honor of Christ—in her backyard! I loved the concept, and I loved the thought of it being outdoors! So this past Saturday I collected all of the pieces once again and reassembled them in her yard. Even as I carried the pieces from my truck, a neighbor asked her what the purpose of this thing was. She explained the concept of this being a cairn for Christ and the reason for wanting to remember Him. She had an uncle that set up cairns in his yard for relatives who had passed. She explained that she felt it all the more important to honor her Savior. 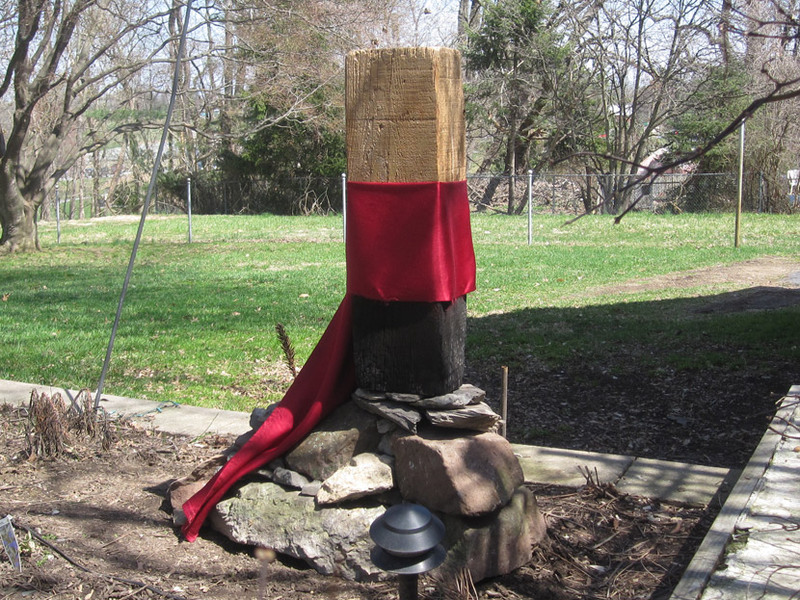 The artwork is now installed in the backyard of a friend, with the purpose of being a cairn to the Lord. Practically, this is yet another example of how restrictions do not hinder creativity. The exact opposite is true! In this case the troublesome shoe stand challenged me and pushed me to places I hadn’t considered. Spiritually, I am thrilled to have this piece being used by somebody and pray it will start many more conversations.